When Geoff Woodyatt learned of the severe damage done to the fingers of a mental health professional when a service user crushed her fingers in a door he searched the manufacturers of anti-ligature products for a solution to this problem. Finding nothing that approached a solution he set about designing and developing something himself using his long experience in the building industry and property management in mental health units he soon came up with a pull handle design that prevented this and also was aesthetically pleasing. He then appointed Dortrend International ltd to manufacture his invention. 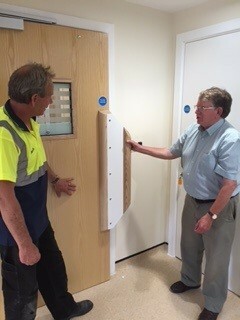 Geoff’s safety handle is now in production and installed in two mental health units already and he has also received a R.O.S.C.A award for his contribution to the safety of staff and service users. 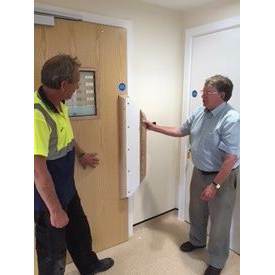 The handle which can be used on double or single doors has applications beyond mental health units specifically in schools or public buildings. standard handle dimensions 1000x285mm and available in different wood materials, oak, ash, redwood and beech. please contact the sales office at sales@dortrend.co.uk for more information.